January 5, 2013, Las Vegas, NV - Newer Technology, Inc. (NewerTech®) http://www.newertech.com, a leading developer of Macintosh®, PC, iPod®, iPhone®, and iPad® performance upgrades and accessories, announced today The Pad Protector mini, a stylish, lightweight leather folio/carrying case for the Apple iPad mini. 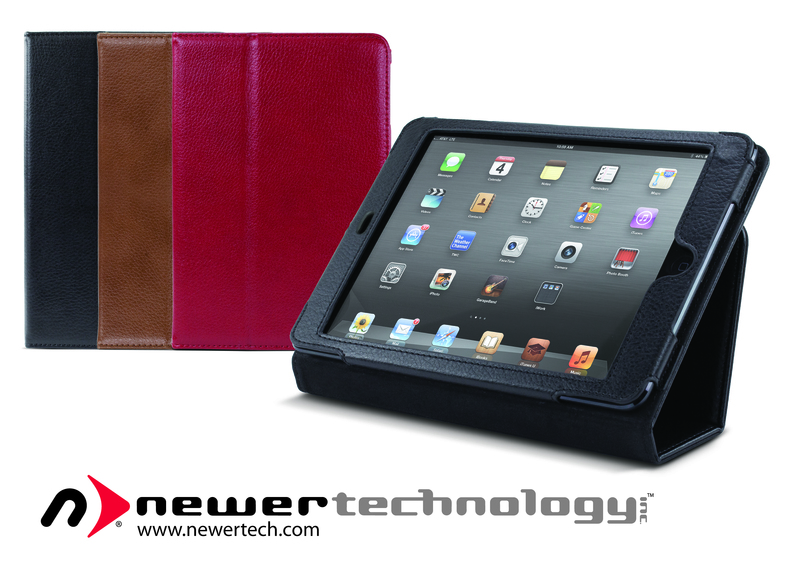 Available in choice of red, black or cognac color top grain leather, The Pad Protector mini keeps the iPad mini protected and looking like new while providing enhanced typing/viewing comfort and complete access to all ports and controls. Available immediately, The Pad Protector mini has an MSRP of $44.95 and will be shown in Other World Computing’s booth #5812, LVCC North Hall, at the Consumer Electronics Show (CES), which begins Tuesday in Las Vegas, Nevada. Combines High Style and Practical Functionality The Pad Protector mini features a luxurious leather cover that discreetly fastens with high-powered, slimline magnets that wake the iPad mini up when the cover is opened and puts it to sleep when the cover is closed. The sleek design includes front and rear camera cutouts for unobstructed images. In addition to supporting vertical and horizontal viewing, the cover also functions like a "kickstand," providing both comfort and stability when typing. Inside, a soft suede lining provides a scratch-free environment for an iPad mini. A side loading, full-framed holder keeps the iPad mini in place while allowing complete access to all ports and controls. Weighing just 6.4 ounces, The Pad Protector mini blends style and function to enhance today’s fast-paced mobile life. "The Pad Protector mini takes everything that was great about the full-size Pad Protector and resizes it into a slim leather folio for the iPad mini," said Grant Dahlke, Brand Manager, Newer Technology, Inc. "High-quality, yet reasonably priced, The Pad Protector mini will keep your tablet protected for years to come, while the color choices allow for a personal fashion statement." Availability, Colors, Price Available immediately in red, black, or cognac top grain leather and priced at $44.95 MSRP, The Pad Protector comes complete with a screen protector, a microfiber cleaning cloth, and a one year NewerTech warranty. For more information, visit: http://www.newertech.com/products/padprotector_mini.php. For more information on NewerTech’s complete line of computer accessories and upgrades for Macs, PCs, and iOS devices, visit: http://www.newertech.com. The Pad Protector is a trademark of Newer Technology, Inc. registered in U.S. Patent and Trademark Office.